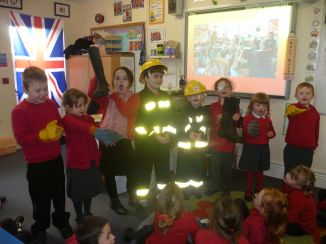 During the afternoon the whole school had a visit from Lindsey who works for the Devon and Somerset Fire and Rescue Service. 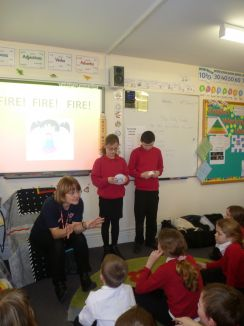 She gave them a talk about what to do in a fire and how to keep yourself safe if a fire occurs at home. To remember the important information they had been told the children were given fun facts and activities to take part in, this included dressing up in firefighting clothes and being shown some of the equipment firefighters need and use. 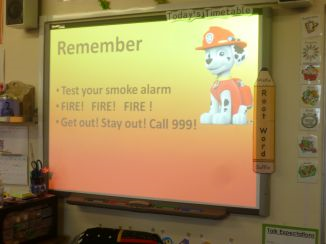 She also explained to the children in KS2 the importance of having a smoke alarm in your home and the noise it made when smoke was detected.